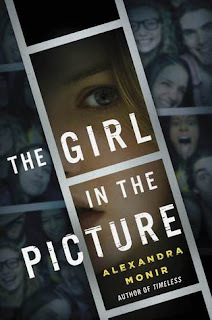 In alternating points of view—that of suspect Nicole Morgan and that of Lana Rivera—The Girl in the Picture helps readers piece together the truth behind a friend's betrayal, a boy's murder, and way too many secrets. I really enjoyed reading this book! I've previously enjoyed her books (though I still need to read Suspicion, which I have to read soon now!) and yeah, this was was really great! I loved the mystery, and the slight paranomoral, and of course, the romance! I loved the way that this story was told-Natalie in the present, Lana in the past, and then it switched. That told us the fullest story of these two girls, without any Chase POV's besides the beginning and the end. Fantastic to read! These girls were friends, and because of a boy, they weren't. And while they were mostly friends because of the boy, that complicated matters! Their families played pretty important roles, mainly Lana's congresswoman mom and Chase's congressman dad. There were political pressures, Lana's mom wanted her to be just like her. Which created a not-so-great situation for the 3 teens to be in! There were quite a few secrets in the end. And betrayals and miscommunications. And yeah, this was a big part of the mystery, because one secret is why Chase died. And navigating the murky waters to find the truth made for an excellent ending! I kinda read the ending before I was done, so I was looking for the clues, and I found them! Loved the ending, so excellent! This book was just fantastic and enjoyable, and I can't wait to read more by Alexandra Monir! Reason Why: Love her writing, and it's a SAC 2016 Book! Sounds like a fun book despite the murder and the love triangle. I like that you sneaked a peak at the end — that tells me you really couldn't wait to find out the ending. Great review! Yeah, there was a love for music and while it wouldn't be traditional fun, it was a really enjoyable read :) And I had to know how it was going to end! And aw, thanks!